Would You Make A Chicken Seizure Salad? 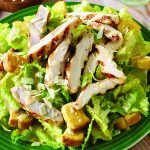 Chicken Seizure Salad … the name itself is probably already giving you a headache. Normally, we are all about keeping food safe. But with irony, the same message can be communicated, to an even greater extent at times! This is a fun video that food safe people will scoff and get a good laugh out of. Some ridiculous actions, like wiping our hands on our jeans, we know we should not do in preparing food. However, these are some of the action that we need to constantly remind ourselves not to do. And what better way to fix our habits then with a good laugh? First, there was GlitterBug. This is the liquid used to show how bacteria can transfer from one place to another. If you want an engaging way to teach children or your staff about hygiene, this is the perfect product for you. Check out the product here. The other one is the Rotten Cookbook, the source of this deadly recipe! There are many other disastrous recipes in the parody cookbook. As mentioned in the video, please do not make any of the recipes in the book … for your own good. You can get this fun don’t-try-this-at-home cookbook here. Would you make Chicken Seizure Salad? (The correct answer is no.) Do you need to adopt different habit in food preparation to prevent your customers, family or friends from spewing? What are the practical steps you can take to keep your food safe?